At this point in the story, the action has moved back to the city from the townships, and becomes a masterpiece of intrigue and political maneuvering. Deputy Chief Judge Martin Sinfield has taken control of things by persuading Francisco to step aside for the good of his health, meaning once again a villain is in charge of Mega-City One, but he's not a ranting lunatic like Cal was. He's a much more subtle kind of bad guy, and it's interesting how so much of the reader's dislike of him boils down to "Sinfield has beaten Dredd and given him an awful assignment outside the City." In fact, for all his villainy - and he's one of the great Dredd villains, no question - Sinfield's actual list of crimes is really quite small. The major one, of course, is using drugs to manipulate Francisco. He's used SLD 88, the drug once used to good effect by the serial killer PJ Maybe, to convince Francisco to step down. The beautiful irony is that Maybe has been masquerading as the city's incredibly popular mayor Byron Ambrose for several years, and doesn't appreciate Sinfield's new planned reforms. PJ Maybe's killed a lot of people in a lot of ways, but he's never planned this level of assassination before. This sets up several episodes of germ warfare, with Sinfield stubbornly refusing to die, and then, in his paranoia, he calls in Dredd to investigate these attempts on his life - which nobody else believes are happening, since he's just coincidentally contracting hideous diseases - just before mutant terrorists make a much more overt attempt to kill him. This leads Dredd to suspect that maybe Sinfield is not so paranoid after all... ah, but more on this in two weeks. The first Zombo story was pretty bugnuts, but it's this one where the insanity is ratched past eleven. This time out, we get an ongoing, ear-splittingly loud supporting character based on Simon Cowell, but in this universe, he doesn't see the Susan Boyle character as a way to make a lot of money, but just another headache. 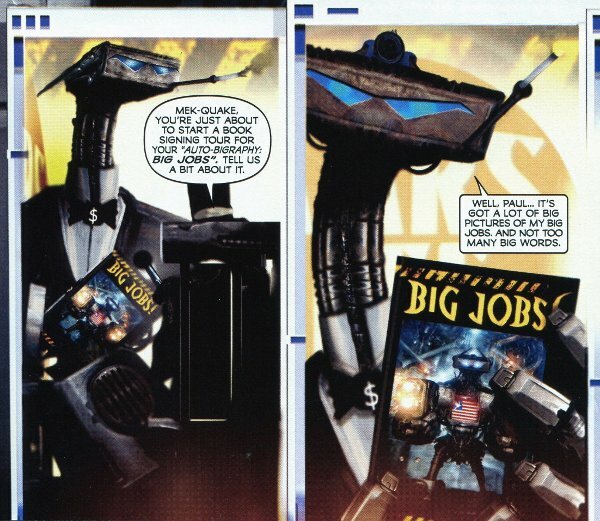 There's nothing quite as hilarious in this concluding episode as the two solid pages of robot mother insults mentioned earlier, but it does have Mek-Quake in a tuxedo appearing on a TV talk show, and Blackblood sending out mass thought-mails to insult everybody else. Classic. 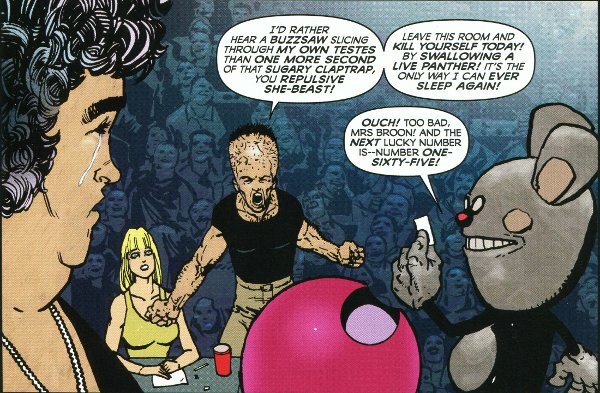 Here's the weakest thing in the comic, but anywhere else, it could be the standout. This is the first episode of a new series - fifteen episodes would appear in a scattered run over five months in 2010, and a second batch of fifteen is said to be in the works for later this year or next. It's future war and political posturing with fist-to-the-chest impact, memorable human characters, very weird aliens, introduced in a really good pilot episode that gives you a fun and flawed audience identification figure, a complex situation, and great artwork by Davis, who alternates with Boo Cook. I saved this one for last - it actually appears second in the comic - because it's just so damn jawdropping. Here's my latest wild pronouncement: No other series in the history of the comic has ever had such a perfect first episode. Yeah, I know, me and hyperbole, but not even the first episode of Zenith, wherein Earth's only two superheroes are killed by an atom bomb dropped on Berlin in 1945, is as great as this. 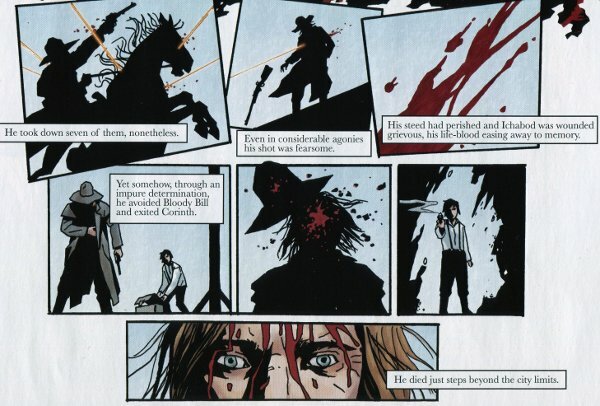 It is a dense and lyrical tale of a cruel killer in the Old West, beautifully written and with very detailed narrative captions, a stylistic choice that has been stupidly out of favor for far too long. These days, maybe nobody does narration in comics better than John Wagner, but darn if Williams doesn't come very close. The prose is just perfectly judged, and Reardon's minimalist artwork perfectly sparse, with a beautiful trick as the color fades away from Azrael's memory. And then the last panel twist. How in the world, I ask you, could you not demand episode two the instant you finish episode one? Next time, Nikolai Dante says goodbye to a close friend. See you in seven!